The K3 Visa Process is something of an amalgamation of the processes for obtaining a K1 visa and a Classic I-130 Marriage Visa. For a classic marriage visa, the petitioner files an I-130 petition for his Thai wife and awaits adjudication of the application and upon approval the application is eventually forwarded on to the US Embassy in Bangkok, Thailand. A K-3 Supplemental Visa application was initially designed to accommodate a faster processing time for those with foreign spouses. That being said, the K3 visa process requires the initial filing of an I-130 application. Upon receipt of the I-130 petition the United States Citizenship and Immigration Service (USCIS) will send out what is referred to as Notice of Action 1. At this point in the K3 process it is time to submit the supplemental K3 application which is essentially the application for an expedited marriage visa. 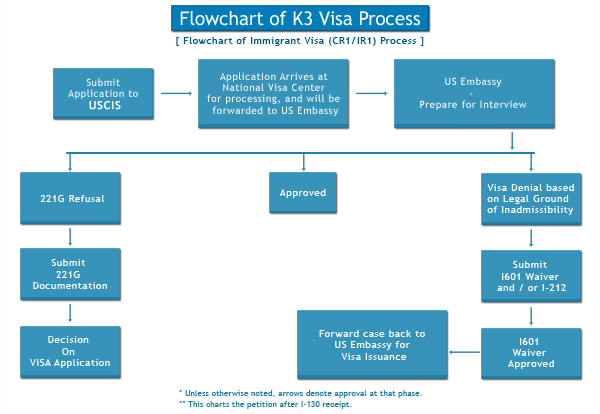 The K3 visa process from this point on is quite similar to the K1 visa process in that the next phase of the process entails receiving Notice of Action 2 (approval notice) and then the case will be forwarded on to the National Visa Center for processing and from there the K3 application will be sent on to the US Embassy Thailand. The K3 visa processing time varies greatly depending upon where the United States Citizen resides. The residence of the US Citizen will determine which USCIS Service Center is used to process the K3 visa application. The final phase of the K3 visa process is the visa interview at the American Embassy in Bangkok. Many Thai beneficiaries are apprehensive about this aspect of the K3 process. There is a misconceived notion that the Consular officers at the US Embassy in Bangkok are “out to get,?Thai applicants for a K3 visa. In reality, the Embassy simply must make certain that the marriage is not a sham and that there is no fraud involved with the petition. As a rule, although the Consular staff at the US Embassy in Bangkok processes a large caseload, they are hard working and willing to assist with pertinent visa matters. That being said, navigating the K3 visa process from beginning to end can be somewhat overwhelming as the process involves two federal agencies (the Department of Homeland Security and the US State Department) along with many forms, applications, and documentation. For more information regarding the K3 visa process please explore the other areas of this website along with the Integrity Legal Blog which maintains up-to-date information about many aspects of the US Immigration process for Thai Fiancees and Spouses.